Gair Consulting ensures that the methodology used in our assessments takes into account the most up to date guidance and legislation to produce high quality, scientifically robust reports. Dispersion modelling is carried out using either AERMOD or ADMS, which are second-generation dispersion models approved by the Environment Agency for use in air quality impact assessments of industrial and other polluting processes. 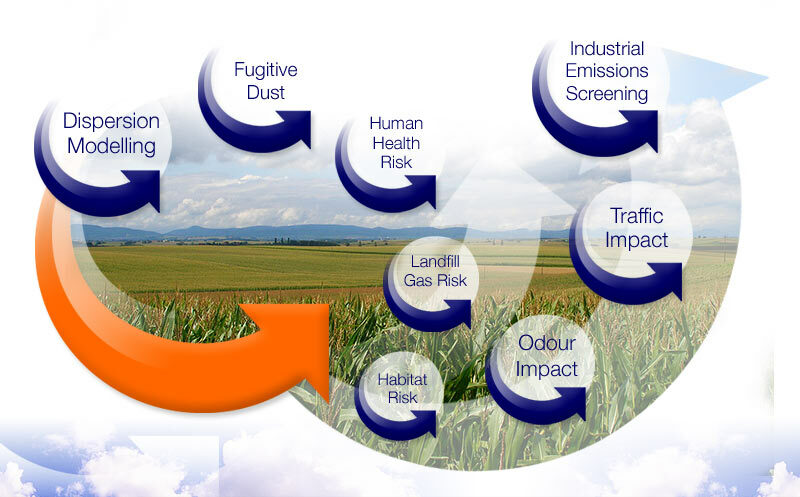 Gair Consulting has significant experience of providing dust audits to industry, including ambient monitoring, quantitative assessments and advice on the mitigation and control of fugitive emissions. Gair Consulting has the capability to undertake food chain modelling of emissions of trace metals and dioxins and furans based on the US EPA Human Health Risk Assessment Protocol (HHRAP) using a commercially available model, IRAP, produced by Lakes Environmental Software. Emissions significance screening and stack height calculations are carried out using the Environment Agency’s EPR H1 and D1 guidance documents, to assist with planning processes or to determine the need for detailed dispersion modelling. Traffic impact screening is carried out using the Department for Transport’s DMRB screening tool to determine the need for detailed dispersion modelling. Should this be required, modelling is carried out using ADMS Roads. Gair Consulting has participated in the testing and validation of the GasSim model and has extensive experience of using the model to carry out landfill gas risk assessments in support of site permitting applications. Gair Consulting has considerable experience in undertaking odour nuisance assessments for a wide range of industrial facilities. Services include odour audits, advice on mitigation and control, dispersion modelling and odour monitoring (e.g. olfactometry, hydrogen sulphide mapping). Dispersion model (AERMOD or ADMS) predictions of ground-level pollutants concentrations are used to assess the impact of emissions sources on nitrogen deposition and acidification at habitat sites.